AdWeek released a new data report conducted by L2 Incorporated that details brands across various verticals and their interactions with the major social media networks: Instagram, Facebook, Twitter and Snapchat. Instagram has continued to prove itself as the best platform for advertisers, as it boasted 92% of interactions for brands when compared to Facebook and Twitter. However, changes to Instagram’s news feed algorithm have started to affect organic engagement rates, pushing marketers towards new ways to capitalize on the platform. Twitter on the other hand has been struggling with overall reach, as brands average 157 customers reach per month via twitter posts. What is most interesting is the way brands have interacted with Snapchat. Marketers and advertisers, it seems, are still attempting to navigate the platform and what it has to offer in terms of outreach and branded content. Between January and October of 2016, 64% of marketers across verticals adopted the app, with watches and jewelry growing the most. However, once a brand opens an account, it more than likely remains unused. This is due to the fact that brands have struggled to produce content for the platform, as Snapchat’s main pitch has been to pay for ads between streams of UGC (User Generated Content) rather than encouraging brands to create their own and make it more discoverable and accessible. 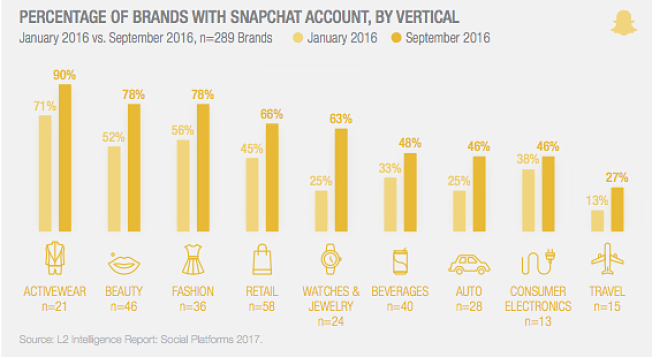 So, what then, can be done to help brands capitalize on Snapchat’s unique platform? More and more marketers and advertisers are realizing that influencer marketing may be the solution. Influencers are able to create the personalized, branded content without being too intrusive — an essential part of Snapchat’s MO and appeal. As of now, dedicated Snapchat campaigns are not yet as prolific as Instagram campaigns. However, as 2017 goes on and Influencer marketing continues to mature, it is becoming evident that Snapchat is an essential part of any influencer outreach program.